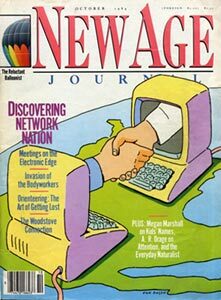 My first encounter with New Age Journal was in 1980 while working for a weekly newspaper in Boston, my first job out of college. I had arranged an interview with Allen Ginsberg, who was in Cambridge for a poetry reading at the Passim coffeehouse with Gregory Corso. They were staying at the home of photographer Elsa Dorfman on a side street in Cambridgeport, and when I showed up there at the appointed time with my tape recorder, ready to talk, Ginsberg was otherwise occupied. A small group of hip-looking folks were sitting around the living room with him, deeply engaged in conversation. They were asking questions way more interesting than the ones I’d scribbled in my notebook. I sat off to the side and waited for them to finish, making a mental note to pick up a copy of the magazine these people worked for. Eight years later, after having sporadically subscribed to New Age for much of the decade, I spotted a newspaper help wanted ad the magazine had placed to find a part-time copy editor. I went for it. Counterintuitively, I wore a suit and tie to my interview rather than a paisley tunic. I still landed the job. Within my first week, I was being asked to help out with feature editing in the absence of the associate editor, who suddenly had decided to leave the staff. It was my serendipitous in. I remained a staff editor, sometimes part time, sometimes full time, until well into the ’90s. And even after leaving the editing job, I continued to write for the magazine, which eventually would be reincarnated as Body + Soul, then Whole Living. During one stretch I was the regular music columnist. At another point I even interviewed for the job of editor in chief, but was edged out by the candidate who, I was told, promised to drive the circ over a million. The numbers never got anywhere close, but the empty promise sounded good to the publisher at the time. And it was just as well, because the mag became increasingly homogenized over the years, eventually morphing into soulless Martha Stewart drivel and then folding altogether. Musician and Mystic: Jimmie Dale Gilmore sings of a spiritual journey. Hi Jeff, I was an editorial intern at New Age in the early 90’s and, while I’m certain you don’t remember me, I have a very specific memory of your reworking some tiny thing I’d spent over an hour writing in about a minute and a half and making it more than twice as good. I learned a great deal in those 90 seconds, and I thank you. Your piece here is the only thing I could find online on the New Age Journal. Which is strange, but again, I thank you! Enter your email address here within the next 10 minutes and, along with your free subscription to this blog, I will throw in complimentary e-mail notifications of new posts. Act now!